Two students from the Science Teachers Accelerated Programme (STAP) are the first ever recipients from the Alafua Campus to be awarded Gold Medal in science disciplines. The recipients are Fatutolo Tuisuga: Gold Medal and the Tropical Garments (Fiji) Ltd Prize for the Most Outstanding Graduate Majoring in Mathematics and Tioata Leleimalefaga: Gold Medal and the John Gibbons Prize for the Most Outstanding Graduate Majoring in Biology. The third recipient, Selina Oikali was awarded the Gold Medal and the Fiji Development Bank Prize for the Most Outstanding student in Bachelor of Agriculture. 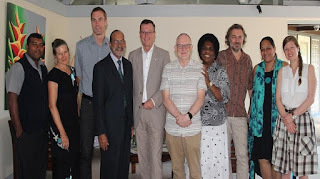 The University of the South Pacific’s (USP) Alafua Campus together with the Faculty of Science, Technology and Environment (FSTE) organised a special function for its three Gold Medal recipients at the Alafua Campus in Samoa. The function was attended by the Prime Minister of Samoa Tuilaepa Sailele Malielegaoi. Alafua Campus Director, Ms Ruby Va’a said that the Campus is home to USP’s School of Agriculture and Food Technology, and through its students the campus is achieving the first of the University’s aspirations for its graduate attributes, that is, academic excellence. PM Tuilaepa expressed his contentment that the Government’s investment with USP for STAP has been very successful. He said that such achievements indicate that the future of science in Samoa is bright and the Government will continue to fuel and support initiatives which bring science to Samoa. STAP model is an innovative cohort model developed by FSTE for delivering the science programme outside the Laucala Campus. The success of the first STAP with over eighty-six per cent (86 %) pass rate (51 out of 59 students) gave the Government of Samoa the confidence to use this modality to train its teachers. Associate Professor Dr Bibhya Sharma, who is the STAP Coordinator highlighted that as STAP was a new science model, it carried a tag of precaution when it started in 2014. However, the high pass rate in the November 2016 graduation showed its success and usefulness; and now the two (2) Gold Medals awarded shows everyone that STAP delivers premium quality education, and the graduates are as good as any other in USP, if not better. The three recipients are an inspiration for all the students based in USP’s regional campuses. Gold medal recipient Fatutolo Tuisuga encouraged the STAP II cohort and Alafua Campus students to take up new challenges as they come. “Being a mature student, the family commitments and employment duties can became challenging at times but with a lot of heart and commitment, we can always make time to study and complete activities,” Fatutolo said. He added that the support from his family and STAP cohort has been very fruitful and the award is a result of that. The three recipients challenged the students to strive for excellence and continue the legacy.